In 1926 H. Earl Hoover, chairman of Hoover vacuums and nephew of its founder, W.H. Hoover, purchased a Dutch-style farmhouse on Green Bay Road. With headquarters in Canton, Ohio, Glencoe kept him in the Midwest but afforded plenty of privacy, space to raise a family, and proximity to the company’s Chicago offices. 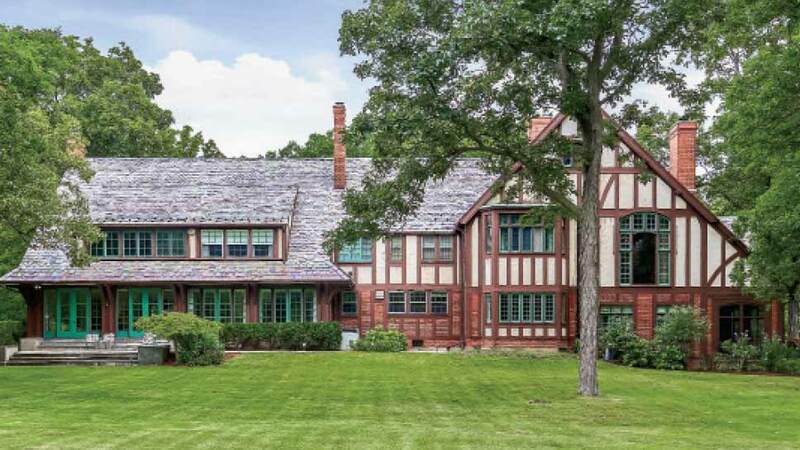 In the late 1920s and early ’30s, Hoover embarked on extensive renovations of the property, converting it into a proper English Tudor, spanning over 10,000 square feet, and adding a coach house and a stable house. A second floor was added to the main house, with a large great room the family adored and lovingly referred to as The Studio. For this space alone, Hoover imported wood floors from England—no attention to detail was spared. Intricate wood trim abounds—nearly every component of the estate, it seems, has been touched by expert craftsmen. The slate-clad roof is adorned with copper gutters. Every element was approached thoughtfully and executed with great consideration. Magnificent beamed cathedral ceilings and 12-foot glass windows on each side of the house showcase the home’s vast surroundings: an expanse of green that seems to go on forever, punctuated by mighty trees. These sprawling grounds span across more than 12 acres, complete with walking trails and a sunken garden (best viewed through the sunroom’s floor-to-ceiling windows). From the moment you enter through the gates and make your way down the wooded driveway, the effect is serene, secluded, and nothing short of magical. It was just this past March when Miriam Hoover, the widow of H. Earl who died in 1985 at age 94, passed away—after over 90 years in the family, the house would finally hit the market, one of the largest privately-owned pieces of property in Cook County (at press time, it is listed at $15.9 million). “Once you land on the property, you can feel how special it is. 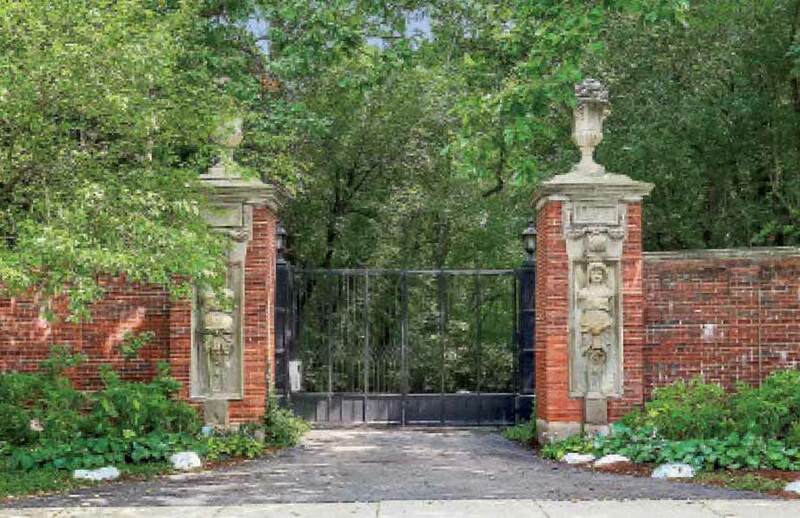 The character of the place has been so well-preserved—you can feel the history,” explains Dreamtown’s Hadley Rue, noted by the agency and the Chicago Association of Realtors as a Top Producer, who holds the exclusive listing for the estate. The Hoovers, though private, entertained regularly at the house, and were particularly known for their jolly Christmas parties. But this welcoming nature and generosity of spirit extended far beyond opening their doors for holiday festivities—H. Earl and Miriam are most remembered for their dedicated philanthropic efforts. Over the years the Hoover family has been major supporters of the Chicago Botanic Garden, Ravinia (Mrs. Hoover also served on its Woman’s Board), The Field Museum, CSO, The Lyric, Art Institute, Glencoe Public Library, Glencoe Historical Society, their church, and numerous other organizations, with particular emphasis in the arts. To learn more about the property, visit hadleyrue.com or call 773-852-4478.